It isn’t even a question — no diet plan helps people lose weight faster and easier than the low carb variety. But even with a wide range of low carb food on the market, people still revert back to their carby lifestyle. Here are the top three low carb pitfalls — and how to avoid them! Anyone who has ever committed themselves to a low carb lifestyle knows that cutting down daily carbs helps drop weight quickly and easily. It is virtually the only diet in the world that can help you lose weight without starving. On top of that, the metabolic state induced by a low carb diet — known commonly by dieters as ketosis — does more than just release “water weight.” With a low carb diet, you are always burning body fat, which not only helps you lose poundage, but also inches. Given all of the benefits of a low carb diet, why do so many people revert back to their old ways of eating, thus regaining the weight? High carbohydrate foods have become not just a mainstay in American cuisine, but also are a cultural phenomenon as well. This is especially true when it comes to celebrating with food in the U.S.: pumpkin and apple pie, bread stuffing, mashed potatoes, breads, cookies, and other sweets are all seen as crucial to the holiday season beginning with Thanksgiving and ending on New Year’s Day. The same is true with birthdays: many of us imagine a birthday bash with a birthday cake to be a downright depressing thought. Because of this, even the most committed low carb dieters plan on taking vacations from their low carb lifestyle around birthdays and the holidays. If you’re someone who cannot imagine a Thanksgiving turkey stuffed with bread stuffing or a birthday devoid of a decadent dessert, then plan ahead by mapping out some alternatives using low carb food products and some innovative recipes. There are plenty of low carb bread products that can take the place of your standard loaf, and low carb, sugar free cheesecakes work wonders as an alternative to the traditional birthday cake. If you feel you must have high carb goodies represented at your favorite celebrations, make sure they are made with low carb food. 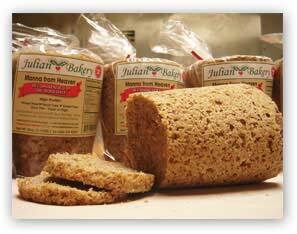 Julian Bakery’s “Manna from Heaven” Low Carb Bread is a Low Carb Diet-saver! The weak spot in a low carb diet is lunchtime. Whereas eggs and breakfast meats are easy and obvious choices for the first meal of the day, and low carb dinners are essentially very similar to traditional American meals sans the potatoes, rice, or pasta, lunch is the hardest meal for Americans to imagine without eating carbs. Sandwiches dominate the American lunch, and many people feel uninspired by the prospect of eating a burger or sandwich without the bun or bread. Again, low carb bread can do wonders for those of us who struggle with a low carb lunch. While not recommended for the first phases of a low carb diet, most low carb bread products are low enough in net carbs that the seasoned low carb dieter can handle a slice or two at lunch. Rather than having those low carb bread slices with breakfast, making them work for a low carb sandwich at lunch can be the difference in the long-term success of your diet. Back in the 1960s when Dr. Atkins began his low carb Diet Revolution, he identified the fact that refined sugar and high carbohydrate foods have an addictive quality that is very similar to the addictions that drug abusers struggle with. He pointed out the fact that the process of refining sugar is almost identical to the process of refining cocaine, and that as we eat more and more carbs, we crave them more and more exponentially. This is because carbohydrates tax our blood sugar to the point that our body wants us to keep throwing sugar “on the fire” to keep our energy levels up, thus leading to alarming weight gain. This is why Atkins advocated for warning labels on sugary foods and implored low carb dieters to not fall off the low carb wagon. Invariably, however, low carb dieters do fall off the wagon, and usually it is a result of sweets. The reintroduction of sweets leads to a slippery slope of more and more carbohydrates that gets people right back to bad eating habits. If you have a penchant for craving sweets — even after months of “sugar detox” — then it’s time to connect with some low carb food products that can really satisfy your sweet tooth. There are so many low carb desserts on the market today that you’re bound to find something that will work with you. As we’ve reviewed in another article, the Atkins Advantage bars are legitimately sweet with very little aftertaste and ultra-low net carbs — perfect for an after dinner dessert! Of course, the best way to avoid these low carb dieting pitfalls is to simply know they exist and take the necessary steps to avoid falling into them. You’ve taken your first steps toward a low carb lifestyle — don’t let yourself get derailed by the “cheap thrills” of fattening carbs and sugar! Thanks for reading our article! Linda’s Diet Delites is a leading online retailer of low carb food, including some of the best low carb bread products on the market today! Be sure to visit our website and join our free newsletter for access to the latest updates from Linda’s Diet Delites, including store discounts, new articles, and more! In spite of decades of negative and misleading press, the low carb diet continues to be the most effective weight loss diet out there and the best way to keep to your New Year’s resolution. But don’t expect to find low carb food options in your local supermarket. Is weight loss your New Year’s Resolution? If you answered “yes,” then you’re not alone: losing weight has long since been a top five New Year’s resolution for Americans. And because a resolution is all about making a long-term change, then a low carb diet is the perfect solution. As Atkins argued in his own Diet Revolution books, cutting carbs in your diet is not a temporary solution for losing weight; it is a lifestyle change that you have to commit to for the rest of your life. While it is true that adopting a low carb diet will quickly allow you to lose weight (some people lose as many as 5 pounds a week in the early stages of the diet), it is equally true that reintroducing carbs back into your diet once you’ve lost all the weight you’re looking to lose will send you back up the scale just as quickly as you dropped it. A new generation of delicious low carb desserts, like Nutritious Creations Low Carb Brownies, can make your low carb diet a breeze. The answer is simple: the vast majority of people in this world are carb sensitive. This means that our bodies cannot handle the level of sugar and carbohydrates that the average American consumes from day to day. Just to give you an idea: Atkins recommends that most people should not consume more than 40 grabs of carbohydrates a day. However, the typical plate of spaghetti with tomato sauce will easily run you above 50 grams of net carbs – and that doesn’t include the big hunk of Italian bread and glass of red wine you have with it! Very quickly it becomes clear why nearly two-thirds of Americans are overweight; typically, we consume three to four times the amount of carbs in a day that we should. It is for this reason that the low carb diet makes so much sense as a viable New Year’s weight loss resolution. There is now a wide range of low carb diets that you can follow, all of which offer different programs for cutting carbohydrates. If you’re planning on a New Year’s weight loss resolution that involves the Atkins approach, then say goodbye to bread, sweets, fruit, and most milk-based daily products. Even though Atkins lets you gorge on protein and fat, his Phase One encourages no more than 12 grams of net carbs per day. Once you begin to progress on your new low carb lifestyle, however, you’ll be able to add more carbs back into your diet, gram by gram. If you’re planning on poking around your local supermarket for low carb food, don’t get your hopes up: low carb food products are few and far between in a standard grocery store. The best place to source low carb food is online through a low carb store. Thanks to e-commerce and fast, automated order fulfilment, an online low carb store can easily supplement your trip to the supermarket with low carb bread, desserts, baking mix, and other products that are hard to find in traditional grocery stores. The foods you buy in a low carb store online are essential, not just for the weight loss portion of your low carb diet, but also for your long-term commitment to cutting carbs for good. Thanks for reading our article! If you’re ready to start your New Year’s resolution with great low carb food products, be sure to check out our online low carb store. We offer hundreds of low carb food options that will make your diet last. For access to the latest updates from Linda’s Diet Delites, including store discounts, new articles, and more, visit our homepage and join our free newsletter. Michael Nace is a low carb blogger for Linda’s Diet Delites, a leading online diet food store, specializing in a wide range of low carb food products. Will You Miss the Carbs? Your First Week on a Low Carb Diet. A long-time low carb dieter prepares you for the difficulties and results you’ll experience in week one of a low carb diet. If you’re about to embark on a low carb diet, be ready to experience a new level of eating, living, and losing that you’ve never experienced with fad diets and the hungry torture known as “the low calorie diet.” The fact is, low carb dieting flies in the face of everything that the traditional weight loss and medical community will tell you: you have to cut out calories and fat and add in tons of exercise in order to lose any weight. If this traditional system of weight loss is so effective, then why are two-thirds of the U.S. population overweight? The answer is simple: while cutting calories will help you lose weight, it’ll also leave you starving and much more likely to fall off the weight loss wagon before you reach your goals. The low carb diet turns these traditional dieting rules on their head. And even though the medical community has tried to disparage Dr. Robert Atkins’ groundbreaking popularization of his famed low carb Diet Revolution, the fact remains that you can indeed eat as much fat and protein as you want on a low carb diet and still lose weight! Millions of Americans have done it successfully, and so can you. How Will I live Without Carbs? Atkins’ books describe refined sugar as being tantamount to illegal drugs: it is highly addictive and highly destructive to the body. Because of this, the first phase of Atkins’ original low carb Diet Revolution plan reads more like a detox from heroin than the first week of a healthy diet. In a nutshell, he calls for a cold-turkey drop of no more than a few carbs a day. Newer low carb diet models are more liberal in the first week of carb counting, allowing for as many as 12 grams of net carbs a day. But even a low carb diet such as this one will be a radical departure from what you are normally used to eating: most Americans eat between 250 and 750 grams of carbohydrates a day, many of which take the form of simple carbs and refined sugars. Even dropping down to 12 grams of complex carbs a day will be a radical departure from what you’re used to. From my own experiences (and I am not a licensed physician nor am I giving you medical advice here), within the first 24 to 48 hours, you will indeed experience a kind of detox from eating carbohydrates. This is particularly true if you use Atkins’ method of cutting out almost all carbs in the first week of your low carb diet. Because your body is used to pumping out so much insulin to maintain a blood sugar for a high carb diet, the sudden drop may make you feel lethargic, hungry, and craving sweets. This is the true “danger zone” of a low carb diet, and the time that many people give up. Little do they know that holding out for the first day or two leads to a steady decrease in hunger and increase in weight loss! Provided you have stuck to your low carb diet and maintained a high level of ketosis, you’ll be amazed at the weight you’ve dropped. I tried the Atkins diet three separate times in my life, and all three times I averaged a loss of seven pounds in the first week! If you’re eating closer to 12 carbs a day in the first week, then you’ll probably lose less, but all in all, you’re bound to see a higher weight loss than you’ve even gotten from a low calorie diet. Also, you’ll begin to notice that you aren’t nearly as hungry as you were on day one of the diet – or for your entire life before starting the diet! Hunger has everything to do with blood sugar, and because eating high protein and low carbohydrates puts your blood sugar into perfect balance, your body simply will not need as much food in order to satisfy your hunger. Over time, you’ll find that the allure of sweets, sugar, and high carbohydrate foods will leave you; as you put more and more distance between yourself and the high carb eating lifestyle you left behind, you’ll look forward to meals that are more savory than sweet, and are helping you to reach your long-term weight goals. Thanks for reading our article! Are you thinking about starting a low carb diet? If so, Linda’s Diet Delites is a leading online retailer of low carb foods. You’ll find hundreds of low carb products that are nowhere to be found in your local supermarket! Posted on December 27, 2010 February 15, 2019 Categories Diet Food, High Protein, Low CarbTags low carb dietLeave a comment on Will You Miss the Carbs? Your First Week on a Low Carb Diet.